Want to take a festive feeling with you when you travel? This 12 Volt LED light set is the solution! 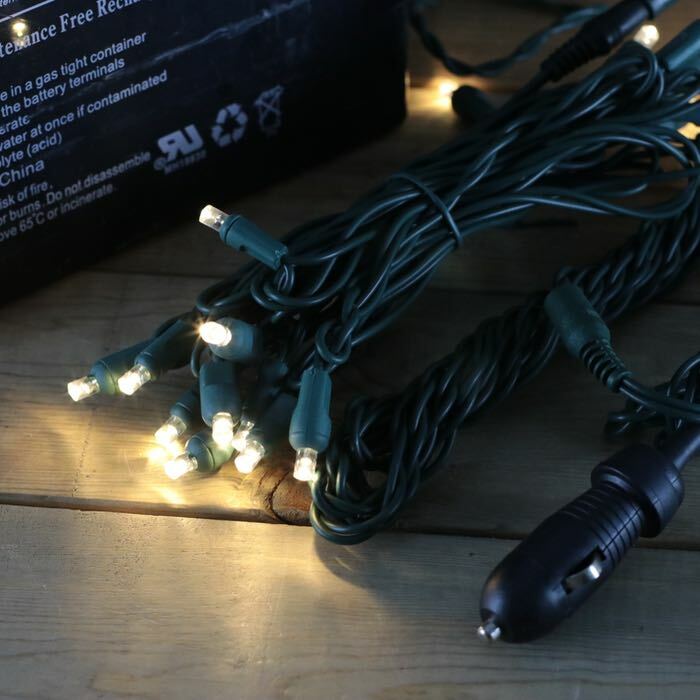 You can hang, wrap or attach these warm white light sets to almost anything. Taking the family camping this weekend? They are an ideal choice for brightening up your campsite as well as making your little neck of the woods an instant party. 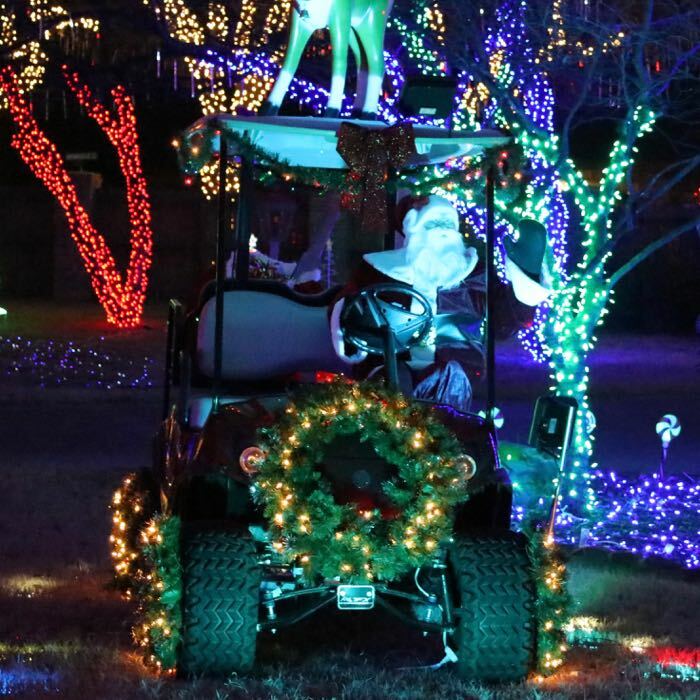 Consider using them in your golf cart to light up a neighborhood parade. If you really want to take the fun on the road, use them in your car on a cross country trip. Those miles will fade away while the family sings cheerfully inside your lighted mini-van! Unbelievably bright and just perfect for my car wreaths. warm light, more like old style lights, work great, low price. will buy more. Everything was great. Lights work great, delivery was on time, and service was spot on. I'm using a 12VDC 5amp transformer to power these. I'm using them to light up part of my yard, but didn't want to bury a 120v power line. They're exactly what I was hoping for. We camp in a tent trailer, and I bought 4 strands to light up the interior. We strung them around the 10' x 10' cabin. Wife loves them. Turns out 2 strands offers plenty of light and plenty of ambience. We'll find a place for the other strands. Wife happy; I'm happy! We put these lights on our electric boat. We put them around the top and around the hull of the boat. The lights around the hull dragged in the ocean (salt water) and continued to work. These are really solid lights. I purchased these for the wreath on my wife's car and they are perfect (Yes, we still do that). They are bright but warm and not glaring. Excellent replacement for her aging incandescent bulbs. Worked with David in customer service regarding some addressing issues (we have very unique addressing in our town). He actually called ME to verify the address! Subsequently over the next two days he made calls to FedEx and back to me to make sure they were delivered properly. Awesome. Thanks, David. Buy! Buy! Buy! I bought three. I found these lights about 6 years ago and have been using them since. I have a horse drawn carriage business and we use car batteries to power the lights on the carriages. I use these lights to outline the carriages and leave them on all year for night rides. I cut off the cigarette lighter plug and put alligator clips on the wires for an easy connection to the battery. This eliminates an inverter on the carriage and the risk that comes with AC current in the weather. I have only had 1 set with a malfunction- part of the lights stopped working after 3 or 4 years on the carriage. I replaced the one strand and I was back in business. I'll send a picture of the latest use to the web site. We used our horse drawn hearse for a parade for a funeral home and they were honoring veterans. They placed a helmet and boots and a flag in teh hearse. I had a platform in the center of the hearse surrounded by glitter garland and 3 strands of these lights. I lit the inside of the hearse and the display very well. Lit up our Halloween Train! So pleased to have discovered these lights. I'll describe my use for them as it may help others with similar needs. I have a remote property and a wall tent structure that measures appox. 11'x14'. I needed lighting and wanted to avoid running my portable generator or using the Coleman lanterns AND wanted to create some ambiance for romantic dinners on the deck. These lights proved to be the ticket. I use a small solar array and control unit to charge a 12volt deep cycle battery then hook it to a car adaptor (the one suggested by this company on their 12v lighting video--from Amazon), then I string five strings of lights in series. Let me tell you, these lights are great. The put out a warm white light that gives more useable light than lanterns. I have three running inside the tent and #4 and #5 outside lighting the deck. Could not be happier. I'm going to buy several more strings in order to light a 20' shipping container that I recently placed on the property for secure storage. Get these lights. You won't regret it. We ordered 4 string of these lights to attach to the solar powered system that powers things around our home. 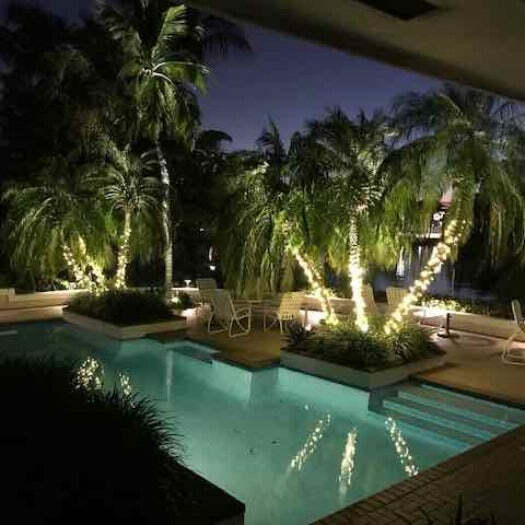 The lights were strung in a Ficus tree around the pool area. They look good with a bight but warm light. Their power draw is almost negligible, which is wonderful. We did not need the 12v auto plugs that come with them. This lights work great in our camper when we aren't able to hook up to electricity. Perfect lighting and good quality. I’ve received the lights! They got here on Tuesday. They are awesome. Exactly what I was looking for. As far as what I need them for, it’s for a theme camp at the Alberta Regional Burning Man celebration called FreezerBurn! I’m looking forward to lighting up the camp J Checked them all and they all work fine. Thanks again for your help. I’ll be sure and recommend your store to any and all who may be in the market for 12 volt LEDs. Q: It may have already been implied in other questions but looking for definitive answer: Will these work if I connect them to my 12v outdoor landscape lighting system? A: That is a great question and we do have many folks using these lights with their 12-volt systems. We just can't be super declarative with a definitive yes or no because we don't know the specifications of your system. These lights do not have inline rectifiers since they are designed to work with DC systems so they will have "flicker" but we haven't had feedback that it's "bothering" anyone so far. Be sure to plug in only a single set to begin with and do a burn-in test with your system. Q: Connecting them to my 12 volt exterior landscape lighting system. 1. Strands are very short and for my exterior tree lighting project I’d require a minimum of 60 strands so a price break is required. Otherwise is less cost for me to run 110 volt out to my yard. 2. Cigarette adapter isn’t required...can that reduce cost? A: These lights are tailored for 12 volt DC systems and are not rectified. Since we don't have a huge amount of markup on these products, with such a massive install you'd be safer, the lights would last longer and it would be more economical to go with 120-volt AC lighting. We do sell the 12-volt lights and cords packaged together so they can't be split up into two separate groups. A: Yes, you can connect up to 30 strings in series. Q: I am looking for one of 2 things -- either a set of white or warm white 12v LED C7 (or C6) lights in the shape of a candle flame. If not, I wonder if you have replacement bulbs that are 12V and C7 LED. This is so hard to find!! A: I'm sorry that we don't have the items that you are looking for. We don't carry replacement bulbs for 12-volt C7 bulbs -- all of ours are 120 V.
Sorry we didn't have exactly what you are looking for. Q: Will the light diffuse outward like a wide angle style bulb if I retrofit a small metal decorative shade to the bulb base? (without piercing the bulb, base, or wire's integrity). I want to hang them from the awning of a vintage trailer for a wedding. These bulbs do throw light in a wider angle than our other lens shapes but they are still fairly "pinpointed" in their lighting distribution. If you have time, I'd order just a couple of samples and experiment with the lights and your covers since it's hard to predict the final look. We are currently closed for the week of July 4th and will reopen July, 11th. Q: What is the shipping time to Minnesota? If you add this item to your cart, you can enter your zip code to find out the cost of shipping to your area for all of the UPS and FEDEX shipping options. Ground shipping generally takes 3-4 days to your area once your order leaves the warehouse. Q: Can these be used outside? A: Yes, these lights are rated indoor and outdoor usages. We warrant them for 90 days of normal, seasonal use.